It is hard to say exactly what truly motivates people to live where they do. Some want to live where they can breathe clean air, or walk out their back door to go for a 1/2 day hike, or head up to the ski hill for a quick ski fix before work, or maybe people want to live in a place where there is an abundance of water, boasting nearly unlimited recreational opportunities. Some people may want to live where they are surrounded by the arts, or where the community never hesitates to extend a helping hand to its brothers and neighbors in time of need. Others may just want to leave the �rat race� behind and live in that quintessential cabin overlooking the lake or meadow. 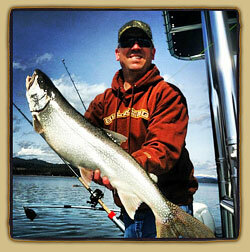 Alex was born in Portland OR and moved to Sandpoint in 1976 where he was raised. Afterward, Alex traveled and worked in resort communities as a Dive Master then Boat Captain. It was the fall 1997, working on Catalina Island CA where Alex met his wife (Lara). In 2001, they had their first child Morgan (girl). At the time, the family was living in Manhattan Beach CA, as soon as Morgan was born, Lara and Alex�s priorities changed dramatically. It was time to move to a less crowded place with a higher quality of life. After searching small towns throughout Colorado and Idaho, the decision to move to Sandpoint came easily. Sandpoint truly does have it all! Alex and Lara now have a second child (Thomas) born in 2004. When the kids are not involved it sports, the family spends time on the lake in the summer and skiing at Schweitzer during the winter.